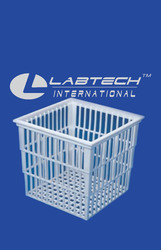 Polylab Test Tube Baskets are made of Polypropylene. These autoclavable, unbreakable and non-corrosive Baskets are ideal for rinsing & draining glassware. These are also useful for storage of test tubes or culture tubes during sterilization or incubation. These Test Tube Baskets are made of Polypropylene. These autoclavable, unbreakable and non-corrosive Baskets are ideal for rinsing & draining glassware. Test Tube Basket are made of Polypropylene. These autoclavable, unbreakable and non-corrosive Baskets are ideal for rinsing & draining glassware. These are also useful for storage of test tubes or culture tubes during sterilization or incubation. Our firm is highly regarded in the organization for putting across best range of Test Tube Basket. One can avail this range at a wholesale rate. Autoclavable Baskets in 3 sizes are ideal for washing, sterilising, storing, carrying Test Tubes, glassware, Vacutainers, etc. Lids have a locking system to securely hold contents. Baskets should not be stacked during autoclaving. 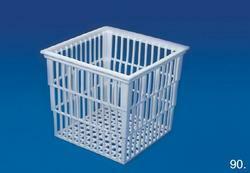 Test Tube Basket Test Tube Baskets are made of Polypropylene. These autoclavable, unbreakable and non-corrosive Baskets are ideal for rinsing & draining glassware. These are also useful for storage of test tubes or culture tubes during sterilization or incubation. Test Tube Baskets are made of Polypropylene. These autoclavable, unbreakable and non-corrosive baskets are ideal for rinsing & draining glassware. These are also useful for storage of test tubes or culture tubes during sterilization or incubation. 140 x 120 x 110 mm 6 Pcs. 160 x 160 x 160 mm 6 Pcs. 400 x 400 x 100 mm 6 Pcs.